The Maui Space Surveillance Site (MSSS) includes the Air Force Maui Optical Station (AMOS) is an asset of the US Air Force Materiel Command's Phillips Laboratory. 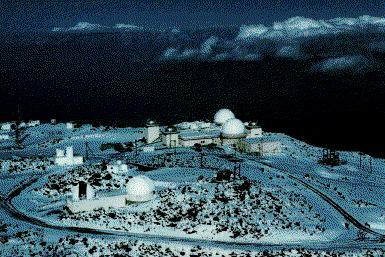 the Maui Optical Tracking and Identification Facility (MOTIF), and a Ground-based Electro-Optical Deep Space Surveillance (GEODSS) site operated by US Air Force Space Command. Located at the summit of Haleakala, on the island of Maui, in the state of Hawaii, the facility is at an elevation of 3000 meters, and a latitude of 20.7 degrees north. This site is characterized by a relatively stable climate of clear, dry air, with low levels of particulants and minimal light pollution. The site is the only one of its kind in the world, combining operational satellite tracking facilities (MOTIF and GEODSS) with a research and development facility (AMOS). The MSSS operates primarily at night, but performs many of its SOI missions 24 hours a day. The MSSS includes a number of sensors used for space tracking, imaging and object identification. It has two 1.2 meter telescopes that provide visual and infrared imaging, which means it can track during the day or night. The MSSS also uses a 1.6 meter telescope to perform day and night tracking and imaging. The MSSS is an optical system used primarily for spacetrack and imaging. It is capable of gathering data on both near and deep space objects at night or in daylight. The MSSS performs its mission using four electo-optical telescopes (a twin 1.2 meter, a 1.6 meter, and a 0.8 meter), and the future 3.7-meter telescope, timing systems, acquisition cameras, laser systems and communications systems for operations and Research and Development. Tracking is done in the polar and declination axes with the azimuth turntable set to a fixed position. The operator slews the telescope to the predicted track point. When the object comes into view, the operator steps the object into boresight and rate tracks it to collect metric and signature data. In addition, the system has a 0.6 meter laser beam director and a 0.8 meter beam director tracker, which can be used for tracking only. Air Force Research Laboratory periodically uses MSSS sensors for research experimentation, to include orbital debris research, earthcrossing asteroid search and tracking, and advanced imaging technology research. Integration of a ladar to the MSSS telescope will provide a 30-db signal-to-noise gain for space object engagements, followed by evaluation for range-Doppler imaging and space debris tracking applications. The system may also be used as a contributing sensor to the SSN.